Boys and Girls, Be Ambitious! The best advice I can give to any international student of Chonnam National University can be summarized with this well-known line: Boys and Girls, Be Ambitious! I remember that during my college years, I juggled academics, co-curricular activities, as well as extra work on the side. I was involved in diverse activities inside and outside of the campus, believing that this would enable me to develop the skills I need for the future. This helped me to reflect on my strengths and weaknesses and develop my personal network and brand. My efforts have paid off by being recognized both inside and outside of the university. This includes being appointed as the 54th Editor-in-Chief of the Chonnam Tribune, the first international student doing so. All of these things would have been impossible if I did not face the challenges that came to me head on. The language and cultural barriers were the most difficult. However, I was convinced that by aiming to have full working proficiency in the Korean language, opportunities would be much wider for an international student like me. Eventually, I was able to find confidence in this once foreign language. By the time I reached my third year in college, I took a step back in retrospect. I decided to focus on a few areas that I am most interested in and that I am good at. I downsized my classes and activities to focus on those areas. This led me to apply for graduate studies which I had the opportunity to pursue right after college graduation. I continued my active lifestyle in graduate school, despite a heavy workload and a lot of pressure. My career started with positions that allowed me to utilize the skills I had honed and experiences I had gained as a student. I was the journalist for a Korean-English bilingual magazine company where I was covering and editing English articles and translating Korean articles into English. After this opportunity, I was offered a position at a multilateral organization where I develop strategies for partnership and networking for the realization of globally-agreed goals, where I continue to work to this day. We may be categorically different, but banking on this as a strength backed by an extensive record of relevant experiences, I strongly believe that international students will be able to realize success on par with their Korean peers. As an old friend of mine will say, “nothing ventured, nothing gained”. Be ambitious, boys and girls! 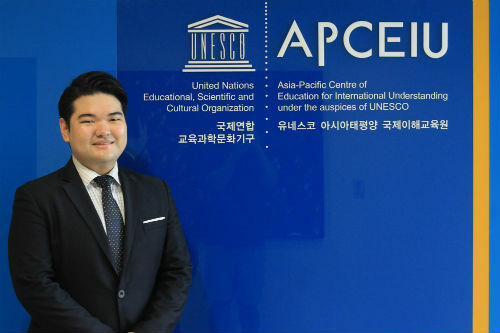 * The writer is currently a Program Specialist at the UNESCO Asia-Pacific Center of Education for International Understanding based in Seoul, Republic of Korea.